An Israeli from Ashkelon stormed out of an Ashdod massage parlor shortly after entering it a few weeks ago and then set fire to the establishment owner’s car, Israel’s Channel 10 reported on Sunday. ‘Y’ then hailed a cab that took him to a nearby gasoline station. With the taxi driver waiting for him, ‘Y’ filled up a container with diesel fuel and then had the cabbie take him back to the relaxation institute. Once back on the property, ‘Y’ set the parlor owner’s Buick ablaze, Channel 10 said. Although ‘Y’ sprinted from the scene upon inflammation, he returned when he noticed the flames beginning to die down. ‘Y’ came back to the burning Buick several times – one time with old newspapers, another time with used clothes – to ensure that the torch job was completed. The owner of the parlor spotted his automobile going up in smoke at some point and armed with a fire extinguisher, he rushed out to the parking lot, Channel 10 reported. Not only did ‘Y’ not flee the scene of the crime, he returned again to fight the Buick owner. As recorded by a security camera, ‘Y’ is seen hurling stones and epithets at the proprietor. Local police caught and apprehended ‘Y’ after closing off all exits from the industrial center where the clinic is located. He was charged with attempted arson and aggravated assault. 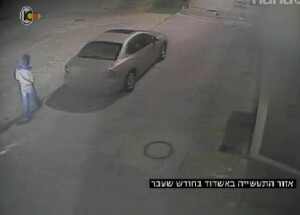 The taxi driver who helped ‘Y’ was indicted by Ashdod law enforcement for failing to prevent a crime, Channel 10 said. Read other articles by Algemeiner Jerusalem Correspondent Gidon Ben-Zvi here.